Castles don’t come any more fairytale-like than the Château de Pierrefonds, Camelot in BBC series Merlin, on the south-eastern edge of the Compiègne Forest. Its pale stonework and its crenellated towers embellished by multi-level turrets – was a fact that was acknowledged by the producers of the BBC’s Merlin when they chose this iconic structure to double as King Arthur’s Camelot in the hit 2008-12 show. 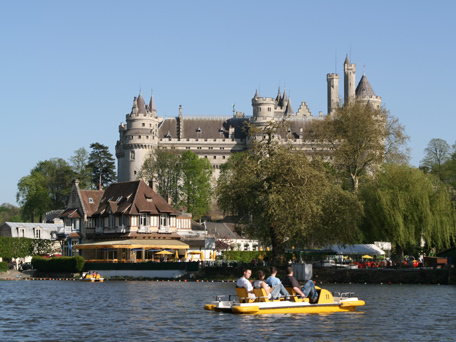 Originally constructed in 1393 for Louis d’Orléans and rebuilt in the medieval style for Napoléon III by Viollet-le-Duc after lying in ruins for more than two centuries, Pierrefonds Castles comes complete with a moat, a drawbridge and arrow slits. Each of the eight soaring towers is dedicated to a different knight. Medieval monsters, fantastical animals and grimacing gargoyles bring every corner to life, while the grounds hold life-size models of catapults. Audio-guides available in a variety of languages including English detail the castle’s compelling history. Don’t miss Le Bal des Gisants in the old dungeons. This display of royal statues, brought here from Versailles museum, is accompanied by a sound-and-light show that makes it both wonderfully atmospheric and more than a little eerie.